It is a great hostel! Definitely coming back if I ever found myself in Nha Trang again! The owner Andy is a great guy! Helpful and always in for a chat or some fun! Together with Julia and bartender Fabian they create a great atmosphere! 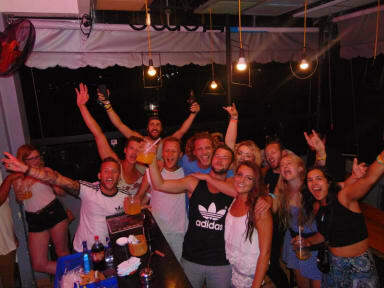 You can party and hang out and meet other people at the bar or sit back and relax in the TV room, and the hostel cooks up great food for dinner! I would definitely recommend this place! Very nice hostel. The rooftop bar is amazing. Decent breakfast and friendly staff. Good to meet people! Rooms didnt look exactly like the pictures, also Nha Trang isnt amazing. However, the people, the staff (especially Max and Julia) made the stay great! Had some great nights on the rooftop bar! Location is great! Vibe in the evening is good too, especially during happy hour:) personell is always available to give advise on trips, good cafe's and must-do's. Escape room is great as well! 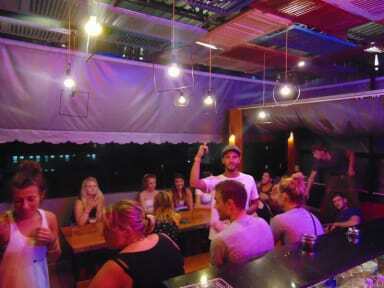 Nice hostel to meet people. It's a party hostel but it is okay if you don't, just bring earplugs. The beds were clean. The escape room is fun and the food is good! For free breakfast you can choose from multiple things, from english breakfast to pancakes. The hostel was okay for a one night stay, that's what we did but I wouldn't wanna stay here much longer. The room wasn't that clean and the so called party at the rooftop bar wasn't really there. Nice staff though they helped us out really well. Atmosphere wasn't that special we were just lucky to have nice people in our room. Just stay here for one night and it'll be fine.